KHDK Electronics, the "mad scientist lab" of a pedal company founded by Metallica's Kirk Hammett, has a brand-new pedal out—and we found the perfect mad scientist to show off its sonic possibilities. Mastodon's Brent Hinds, whose Official Reverb Shop is launching this Thursday, tears into the Unicorn Blood in the video above. 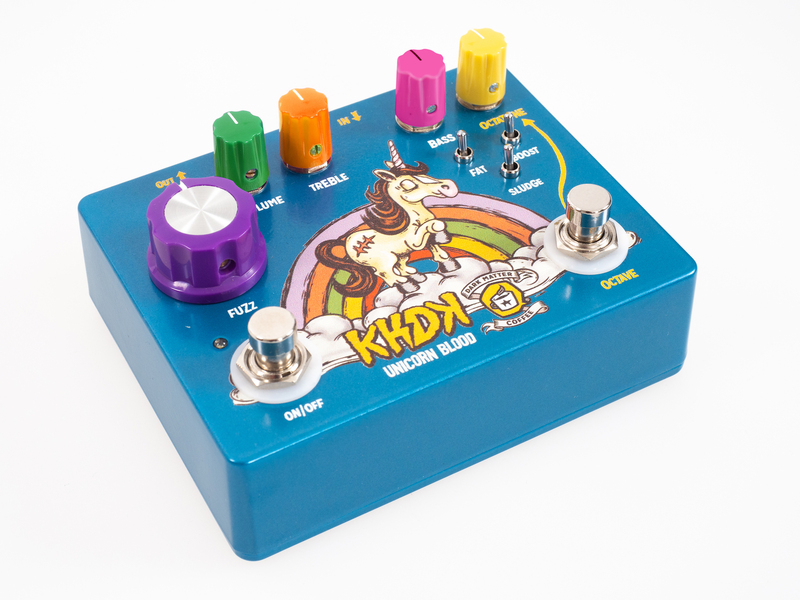 KHDK has only made 100 Unicorn Blood pedals and does not plan to release any more—making it almost as rare as its namesake. As you'll hear quickly, it's capable of truly searing tones. The dual effect stompbox, made in collaboration with Chicago's Dark Matter Coffee, has a Fuzz channel on the left with a standalone adjustable knob and an Octave channel on the right adjusted by its own Octatone knob, with Fast, Boost, and Sludge switches to add or cut tonal complexities across the board. According to Hinds, "It mixes fuzz with coffee and also with cream," with the switches determining "how much cream or sugar you want." Of course, while not technically correct, this terminology may help to get the point across as much as any other. "It's a delicious-sounding pedal, promotes good vibes and mystery," according to Hinds. While at the time of shooting, it was true that "the pedal's not out and you probably won't ever find it anywhere," as Hinds says, it is in fact out now and available on Reverb. Click here to get your own.